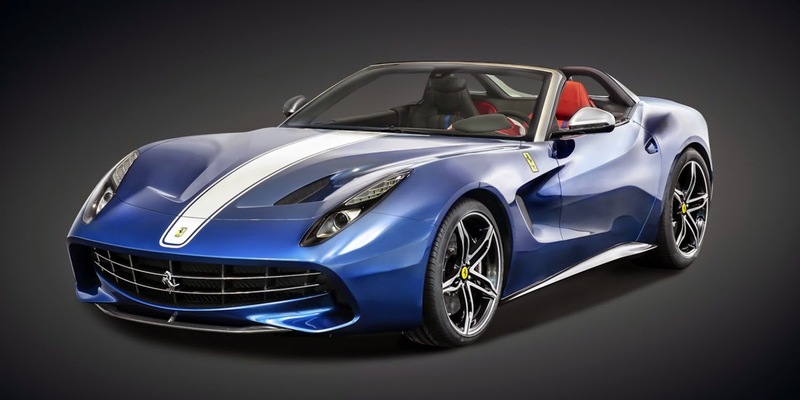 Ferrari has unveiled the limited edition, USA-exclusive Ferrari F60 America, which has been designed to celebrate the company’s 60th anniversary in the land of the free. 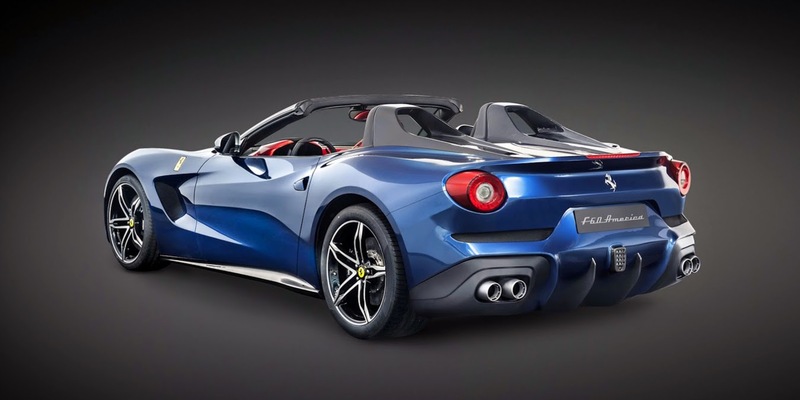 Based on the F12 Berlinetta, the open top Ferrari F60 America shares not a single exterior body panel with the coupe. Without a permanent roof, the F60 features two leather clad roll hoops that are visually linked to two flying buttresses, finished off in carbon fibre, that stretch almost the entire length of the car’s boot. If unfavourable weather hits, the passenger compartment can be sealed off from the elements via light fabric top. The F60′s maximum speed, though, in this configuration is 120km/h. The F60 America is expected to be powered by the same 545kW/690Nm 6.3-litre V12 engine as the F12. 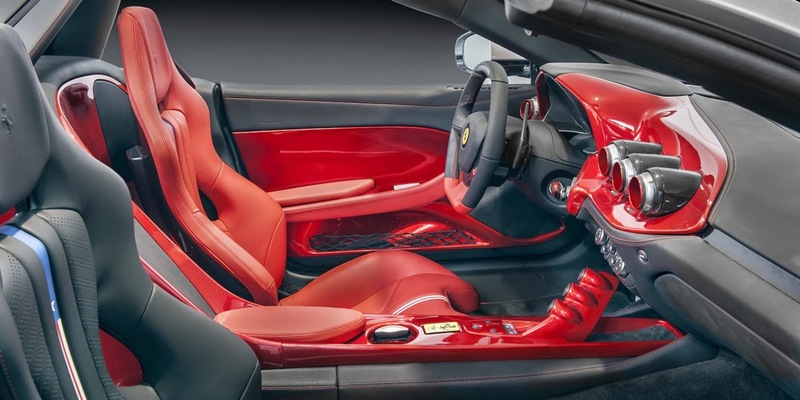 Ferrari claims that the F60 can complete the 0-100km/h dash in 3.1 seconds — the same time as the F12 — but has yet to confirm the F60′s power and torque figures. North American Racing Team livery adorns the F60′s unique body work. The cabin features composite trim, painted a striking shade of red, on the centre tunnel, door panels and the top of the dash. The driver’s seat is decked out in red leather, while the passenger’s pew is clad in black leather. Both seats feature a stripe down the centre in the colours of the American flag. Just 10 examples of the F60 America will be produced and they have all been spoken for. Unverified reports indicate that the F60 will cost each of its lucky owners a sweet US$2.5 million ($2.9 million). That’s over seven times more expensive than the F12 Berlinetta on which it’s based; Stateside the F12 carries a pre-tax price of US$318,888 ($370,000). The F60 America will debut in the flesh at a gala event over the weekend to celebrate Ferrari’s 60th anniversary in the USA. This invite-only dinner will be the final event of Luca di Montezemolo’s tenure as Ferrari CEO. This isn’t the first open top version of the F12 developed by Ferrari. Earlier this year, at an event Sicily, the company showed off a one-off open-air Ferrari F12 TRS. Featuring a redesigned rear and sides, as well as speedster-style windows, the TRS was created for an anonymous client.